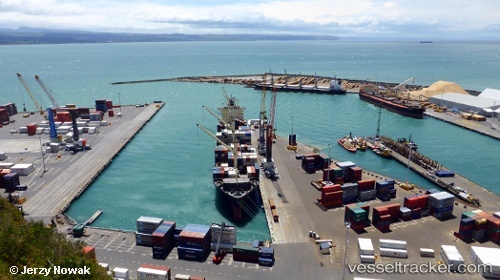 A chemical leak which closed part of Napier Port earlier today, Dec. 17, has now been contained. Inspectors found a small amount of sodium hydroxide, a corrosive and potentially flammable chemical, on the outside of four containers unloaded from a ship this morning. The port was closed after the spill was discovered and the fire service was called in to decontaminate the scene. Three fire trucks, along with a combined hazardous materials unit and command centre were sent to the port at 8.20am. Fire Service spokesman Mike Wanoa said there was no danger to the public because a secure area of the port was blocked off. Fire crews had decontaminated the area by 3pm, isolating the four containers and repairing a fifth container - believed to be the source of the leak. The source container remained cordoned off.